Will the face of the 2019 Lok Sabha be young—No! It’s a notion about Indian General Elections that the youth here elect their much older representatives. One can dismiss it as privilege observation but looking at it deeply one feels that it is not a wrong observation after all. In the constitutional history of India Sixteen Lok Sabha was the second largest comprising of very senior old members. When the fact is, at the time when this Lok Sabha was elected, India had the largest youth population which it still has but comparing it to the first Lok Sabha formed in 1952 had the average age of its members around 46 years where as the average age of the elected members in 2014, Sixteen Lok Sabha was 56 years. That establishes that this was only a little younger than the 15th Lok Sabha which is considering being the oldest in the constitutional history of India. Now the question facing us is at which pedestal that 17th Lok Sabha? Will the old tradition of the young choosing the young is going to continue or will it pause or the old legacy will go on. Will the face of the 2019 election be young and will give this country are youthful. But looking at the trend, this scene is next to impossible. Barely seven to eight months away from the general election eighty per cent of the candidate vying for party ticket have and average age of 50 years. This does not prophesy are a youthful parliament. What would to be the average age of our elected members in coming general election? It depends on the fact whether the youth today has shown an inclination to join politics, the answer to which as of now age ‘No’. Though in the recent past the youth have shown in enthusiasm in the election process but as per as joining politics is concerned that same enthusiasm is missing. Barring the families where joining politics is a family tradition, not many youth are coming forward to take up this opportunity. Only two fields in India display dynastic mindset- Politics and Bollywood. It is an eye opener to discover that in a country of one billion and thirty 7 Crore, Bollywood cannot boast of even ten fresh faces who have no family connection with film industry. It is strange that more than fighting the crisis of money the film industries is facing a crisis of discovering new talent. Ironically India is a country with the largest youth population in the world. Around 65 Crores of Indians are in the age groups of 35 years of less but Bollywood has still not benefited with this bourgeoning youth population. Bollywood is trying to look for a future within its own ten to fifteen dynastic film families. Almost similar is the scene in Indian politics. 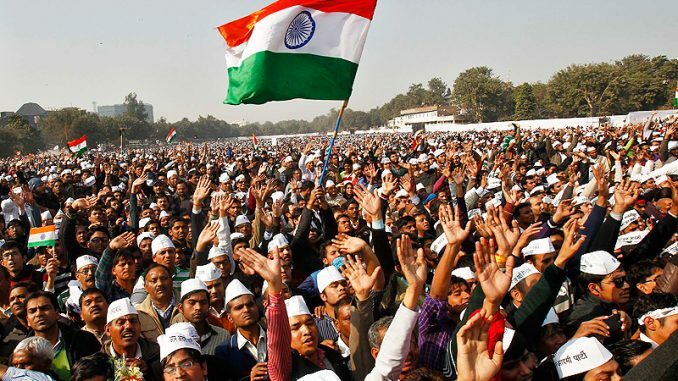 In spite of the massive youth force and rise in the literacy rate, Indian youth is still indifferent to the idea of making an entry into the political arena. Though it’s a different story that all major political party try to lure the young and it’s a fact that the large youth brigade was responsible for the BJP’s landslide victory in Sixteen General Election, 2014. Some known critics and political analysts believe that BJP is going to count heavily on youth support and they are constantly trying to figure out which national leader belonging to which national party holds out the maximum charisma to the youth. It is the tragedy of Indian politics that the youth power which can catapult a national parties fortunes are used, abused and exploited for the short term gains. They dole out the promises of a grand future to the young and self less cadres and create an aspiration in them to shine in the Indian politics. But once the time to distribute election tickets arrives it is again the old cronies, under the grab of experience leaving the youth high and dry, de-motivating millions of others who ever dreamt of creating a niche for themselves in the Indian politics. The only role that is cut out for them is to remain perpetual psycho fans for the influential political leaders and left to wait endlessly in a search of change of fortunes in the next upcoming elections. This does not stop here but also this youth is used for creating social unrest for their political parties and leaders’ political game. That is the biggest reason for the disenchantment and disinterest of the youths in a political carrier. 1 Comment on Will the face of the 2019 Lok Sabha be young—No! a fact based analysis . offers a grwat reading . A PoV which looks to be a reality. The largest Youth population of the world have their aspirations … can it be belied ?